Garam Masala is a mixture of cinnamon, cardamom, cloves, cumin, coriander, nutmeg, and peppercorns. This is one of my favorite Indian spices, if not one of my favorites, period. It’s a warm spice (literally that’s what garam masala means), without heat. Thanks to the complexity of the garam masala, this plus salt and pepper, are all you need to prep the tenderloin. I buy it readily in supermarkets, but you can make your own and the best site for finding excellent spice blend recipes is at Kevin is Cooking, to be sure. Since the tenderloin is a lean cut of meat, it only needs two hours (or less) until it’s juicy and fork-tender. The meat remains pink because of the gentle slow cooking but don’t worry, it’s absolutely done. A meat thermometer is your best friend to ensure perfection without ruining overcooking the tenderloin. This parsley vinaigrette is nicely drizzled over the couscous salad as well as the meat for a fresh, Mediterranean delight. One of my taste-testers who took some of this home said her daughter used her finger to get the last little bit out of the bowl. I couldn’t blame her, I loved it too. And what’s not to love about getting a full meal in one pot? The warm couscous and raisin salad cooks for 15 minutes in the slow cooker after the tenderloin is removed. The potent liquid that’s left behind is the perfect medium for flavoring the couscous. Just before serving, toasted almonds (don’t skip the toasting part!) are tossed into the couscous/raisin mixture. 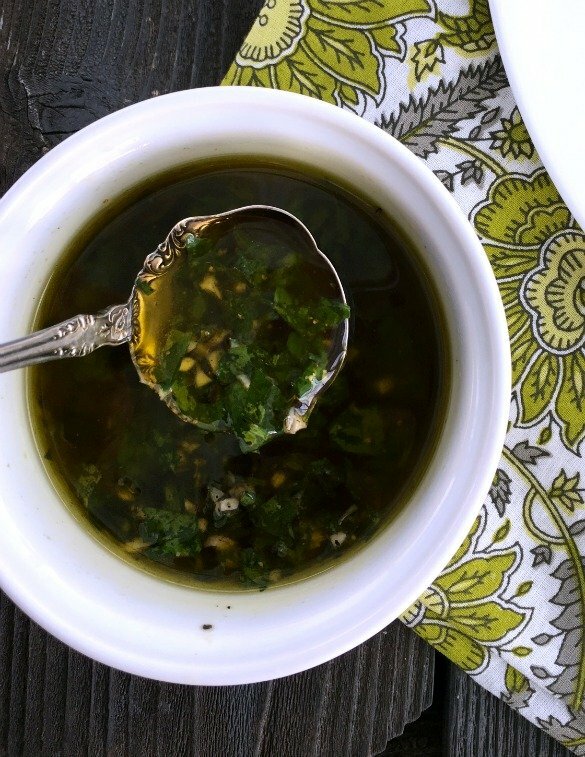 Then drizzle the parsley vinaigrette over everything. Light and flavorful, ready in no time, one pot. Sounds like dinner to me! 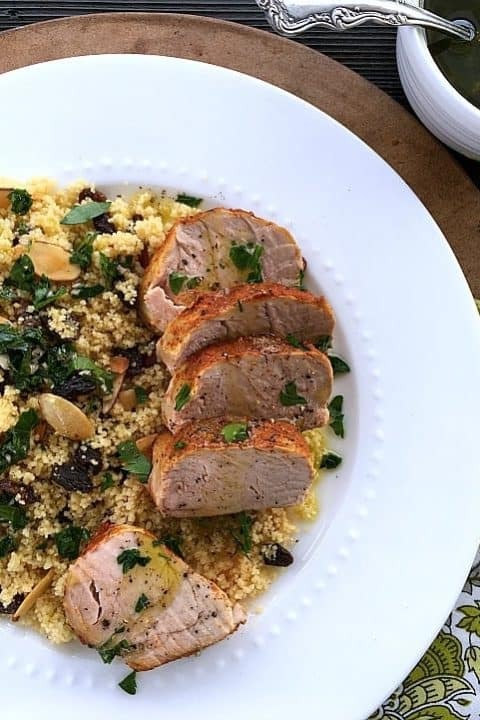 Ready in just a couple of hours, juicy pork tenderloin with a side couscous salad featuring a delicious parsley vinaigrette for spooning over the couscous and the pork. The tenderloin will be a rosy color throughout, since it's cooked gently in the slow cooker. Super juicy and tender. This was so good! I had one 1.5lb tenderloin & seared it first to get the spices to crust. Cooked for 1-1/2 hrs on low but forgot to check temp earlier so could’ve probably done a little less (will check at 1 hr next time). The couscous was perfect & chimichurri really made the dish. May try to add veg next time or on the side like asparagus or haricots verts. This looks amazing! 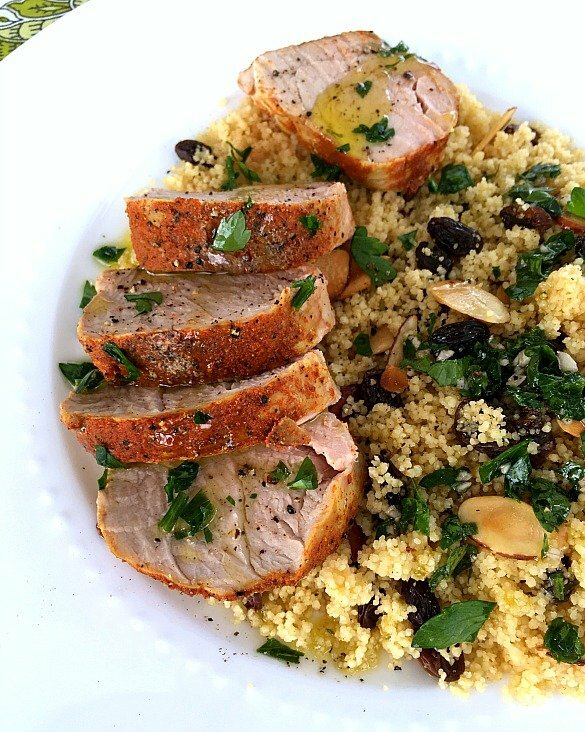 I haven’t made pork tenderloin in a while, and never paired it with couscous. Bookmarking! 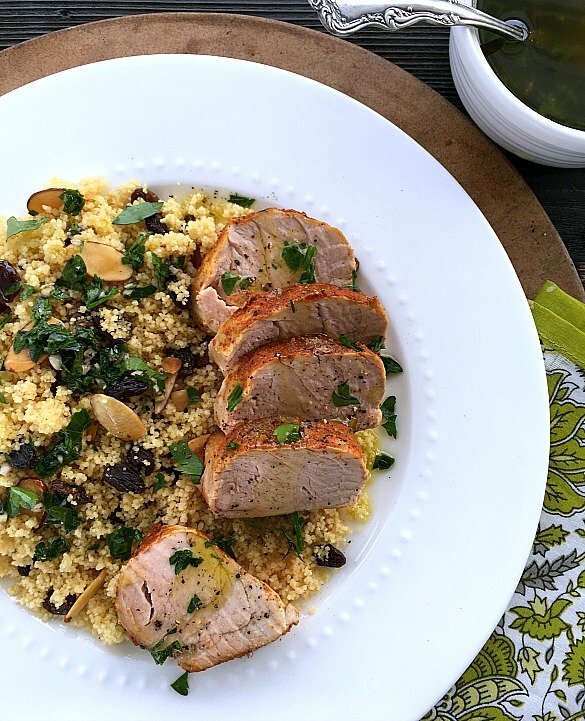 I love anything with Mediterranean flavours and and we are always looking for new ways to jazz up pork. What a great recipe, loved it! I must try this recipe! I love the spices you have picked! Especially garam masala! And the slow cooker is my favorite way to cook pork! Thanks for the inspiration! Do you have a Instant Pot version for this recipe? Hi Diane, not yet. But here’s what I’ll do when I test it in the Instant Pot if you’re willing to try, knowing you’re taking a risk ;). I’d combine all the ingredients in the Instant Pot and then pressure cook on High for 4 minutes. Do a natural release and then check the tenderloin internal temps to make sure it’s reached 165F degrees. If the couscous is not done, turn the IP on Saute’, add a little more liquid if necessary and cook, stirring occasionally, until al dente. Personally, if you’re making this for a group or event, I’d just make the slow cooker version. It only takes an hour or two. I don’t know if this helped you but I’ll be working on an Instant Pot version of this soon because it is a popular recipe. Thanks for your feedback. I just started using the Instant Pot this week and having so much fun trying different recipes. Not sure if I want to try a untested recipe at this point. I am thinking that searing the pork might be needed. I will be trying your Instant Pot Chicken Wing recipe tomorrow. Looks great! Family loved the chicken wings! Juicy and so easy! I made the spice mix and used the Buffalo style sauce. Will definitely make again! Wow – this was delicious! Entire family gobbled it up. It will definitely be on my regular rotation from now on. The 1 cup of couscous was just enough to serve 4 and if you are actually cooking 2 tenderloins, it would be way too small on an amount. Excellent meal! Can this be done without using a slow cooker? Hi Sharon, I’m sure it can be made in the oven rather than a slow cooker. I haven’t done it though, so I’m just guessing here with the instructions. I’d start with a 325F degree oven and use an instant-read thermometer to remove from the oven at 155F internal temp. Check at around 35-40 minutes. Then I’d make the couscous on the stove top, using some of the pan juices for the liquid. Add water if more is needed. Thanks Betty! It’s so great because it flavors the couscous and the meat at the same time! Should I brown the tenderloin first? Hi Alison, Not necessary to brown the tenderloin first. You’ll get plenty of flavor and color from the seasonings. This is a favorite of ours. Hope you like it! Is the combined weight of pork 12-16 oz? Or 2 pcs, each weighing 12-16 oz which would weigh combined 24-32 oz? Each tenderloin is 12-16 ounces. I want to make this recipe because it sounds like it will be delicious. My concern is that 2 hours is not very long for a slow cooker recipe on the low setting. 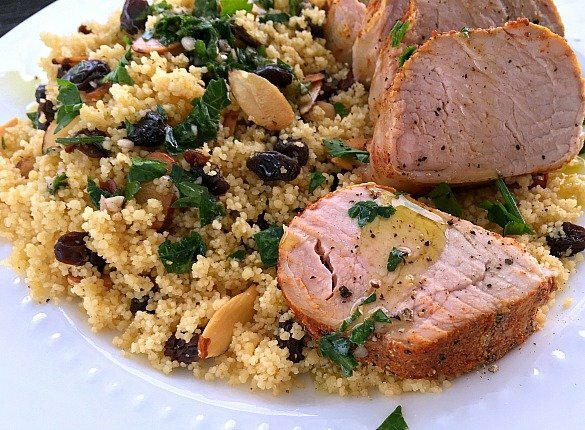 I’ve looked at other pork tenderloin recipes and the cooking time is from 4 to 8 hours on low. I just wanted to make sure there wasn’t a misprint. Thank-you.